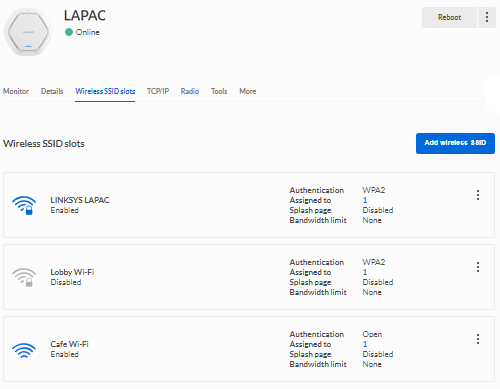 The Linksys Business Dual-Band Cloud Access Points distribute secure Wi-Fi connection to different networks and provide cloud management features so you can monitor your networks from anywhere at any time. 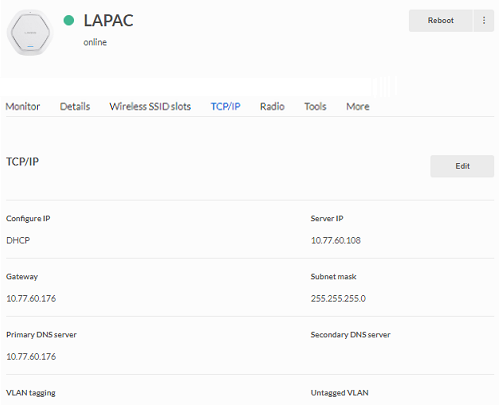 The Access Points settings page allows you to configure an access point and monitor its status or performance. It has seven main sections. Click on the links below to learn more. The Monitor section displays the activity of the access point. To access this section, follow the steps below. Access your Cloud account. For instructions, click here. Select a network and click Access Points in the top blue bar. Select the access point you would like to configure. You have now accessed the configuration section of the access point. Load - shows the access point’s consumption of the computer's CPU. Memory - shows the access point’s memory consumption. Access point status - shows the daily status of the device. You can also select the date that you want to check. It displays the online/offline status of the device. Any red bars indicate when your access point was offline. Hover your cursor over a red area to view the offline timeframe. It also displays the current time on the access point. If you want to adjust the time, click on the More section. You may also read the More section of this article. Device stats - shows data about clients and the traffic. You can choose from the Last 7 days, Last 24 hrs, Last 60 mins, and Real-time. Click the Bandwidth section to view the bandwidth traffic information. Click the Max concurrent clients section to view the number of clients connected to the access point. The area you click will be highlighted in blue. Connected clients - shows a list of your connected clients. 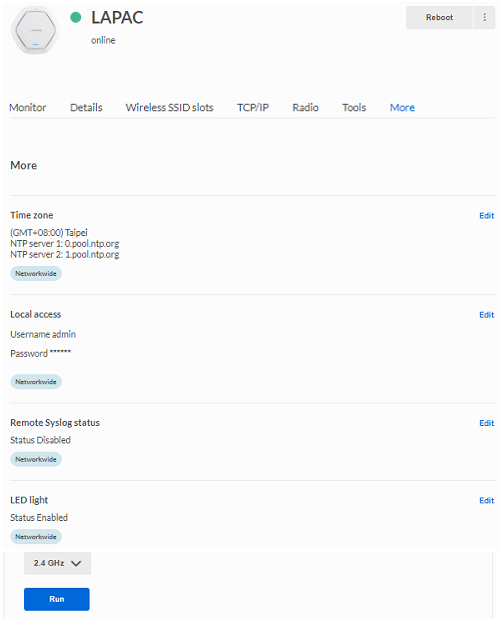 It also allows you to display the following client's information: Last Seen, Wireless SSID, Signal, Bandwidth, MAC address, Hostname, First seen, Bandwidth uplink, Bandwidth downlink, Usage, Upload usage, Download usage, Packets uploaded, Packets downloaded, Policy, and Connection started. To hide or unhide a column, click on the Settings (gear) icon and highlight the setting that you want to display. Ellipsis icon - click the ellipsis icon to access the client device's settings. 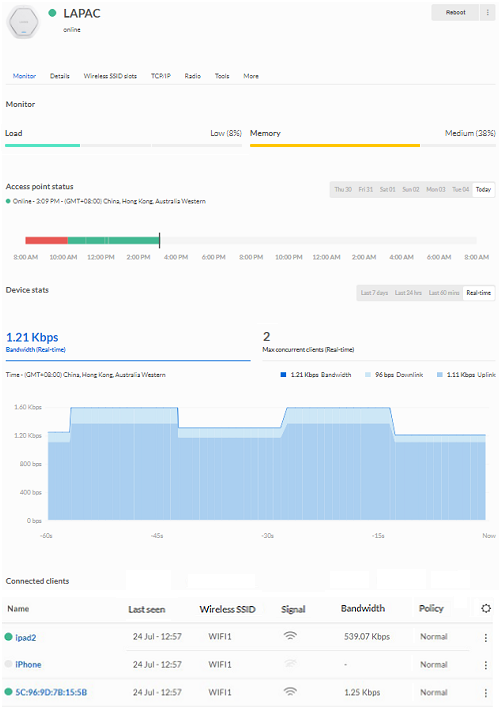 Connection - shows the status of the client's connection to the access point such as the duration of the connection, bandwidth, and signal strength to power (dBm) statistics. 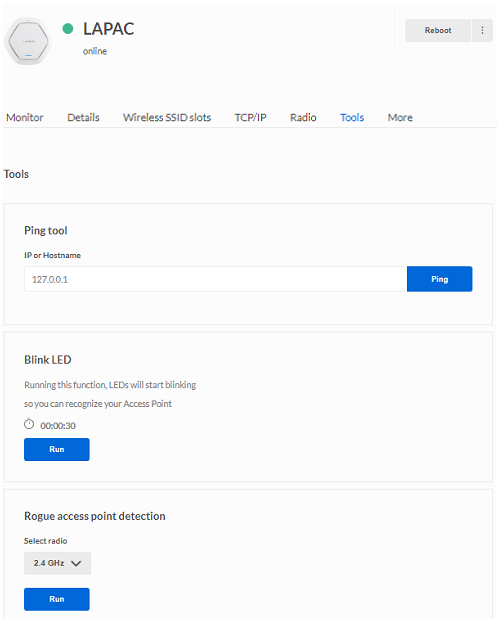 It also displays information on the access point that it is connected to such as the SSID, access point's name, and the usage and packet information. Details - shows the clients MAC address, name, and when it was first and last seen by the access point. 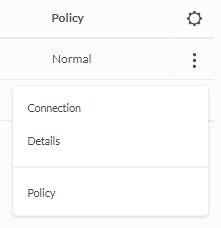 Policy - allows you to configure between two policy settings for a client. Normal - select this option to allow a client to have unrestricted access. 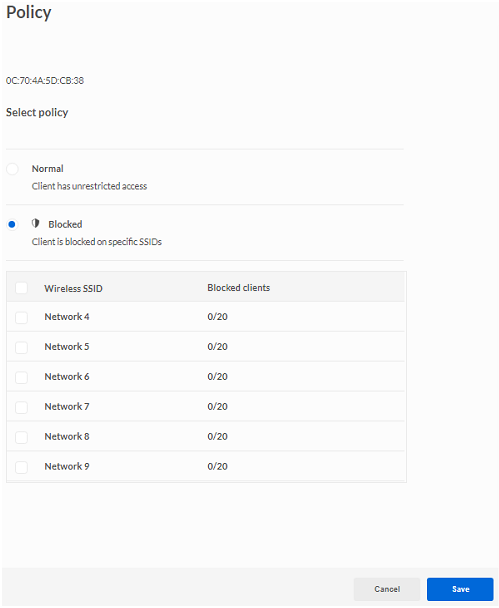 Blocked - select this option to block a client from an SSID. Click Save to set the policy. The Details section displays information about the hardware. Below is an overview of the Details section. Connection status - displays the cloud online/offline status of the access point. Hardware address - displays the MAC address of the device. Serial - displays the serial number. Vendor - displays Linksys as the vendor. Model - displays the model number. Firmware version - displays the current firmware version. Click Check for upgrade to see if there is newer firmware available. If there is a new firmware available, click to proceed with the firmware update. To learn more, click here. NOTE: Do not turn OFF your access point during the upgrade. After the update, the access point will reboot. Check the light behavior and wait until the access point has finished rebooting. After the reboot, you may need to refresh the browser to display the updated firmware version. Name - displays the name of the access point. To rename the access point, click Edit. Enter a new name, then click Save. Notes - displays your notes. Click Edit to add notes then click Save. 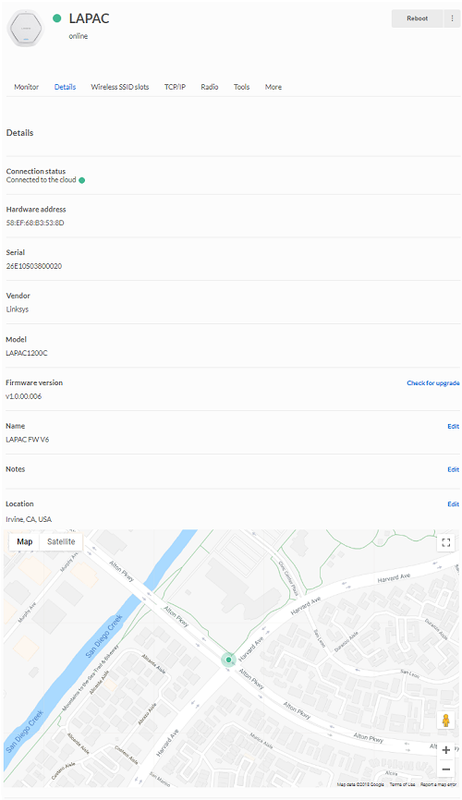 Location - displays the location of your access point using Google® Maps in either map or satellite view. Follow these steps to add your device on the map. Scroll down to the Location section and click Edit. Enter an address, city or zip code in the Address field. Click Save. The Wireless SSID slots section displays the SSIDs that are associated to an access point. Wireless slot status - shows you the SSID, if the SSID broadcast is enabled (Wi-Fi icon is highlighted) or disabled (grayed out), and if it is open (no lock icon) or set up with a password (with lock icon). Selected an SSID, click its corresponding ellipsis icon, and then click Settings. In the Wireless settings section, look for Status under the General tab. Toggle the slide switch to disable or enable the SSID broadcast. Click Save. Enabled - the toggle switch is highlighted and the SSID broadcast is enabled and available for clients. Disabled - the toggle switch is grayed out and SSID broadcast is disabled or turned off but still associated to an access point. Authentication - displays the authentication type of the SSID. To configure the authentication settings of an SSID, click on the ellipsis icon > Settings. To learn more about creating an SSID and securing it with a password, click here. NOTE: The cloud manager supports WPA2™ or Open only. 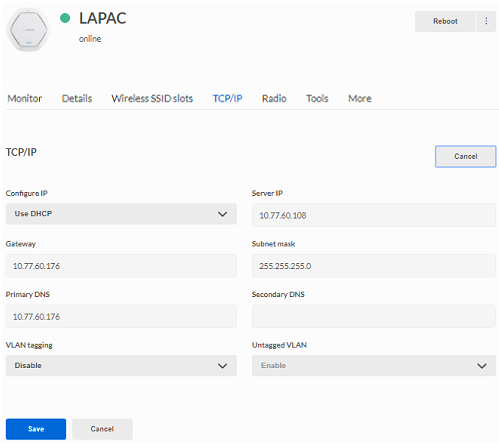 If your network requires other type of Wi-Fi security such as WEP: 64 bits or 128 bits, WPA™ Personal, WPA/WPA2 Personal, WPA2 Enterprise, and WPA/WPA2 Enterprise RADIUS, you will need to disable the cloud manager and manage the access point using the local web interface. To learn more, click here. Assigned to - is the number of access points that are assigned to this SSID profile. Click the number to view the access points. Splash page - displays if the splash page (captive portal) is enabled. To configure the splash screen, click on the ellipsis icon> Settings. To learn more, click here. Bandwidth limit - shows the SSID's wireless speed limit per access point. To configure this feature, click on ellipsis icon> Settings. To learn more, click here. Settings - click on this option to enter the Wireless settings page for the SSID. To learn more about SSIDs section, click here. 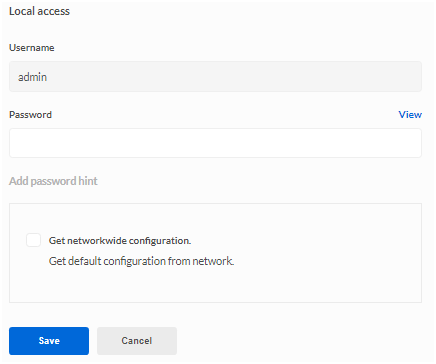 Delete slot - click this option to delete an SSID slot from the access point (removes and turns off an SSID from the access point). Deleting a slot does not delete the SSID profile; it only removes it from the access point. To permanently delete or disable an SSID profile, go to the SSIDs section. To learn more, click here. ​​​​​​Reboot button - click to reboot the access point. Click ellipsis icon > Rename. 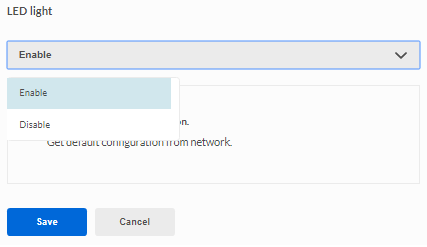 Enter a new access point name then click Confirm to rename the access point. Click ellipsis icon > Move to inventory > Move to move the access point to Inventory. Click ellipsis icon > Delete > Delete to delete the access point. An access point can support up to eight wireless SSID slots. 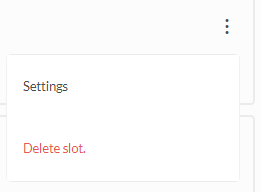 Follow the steps below to add or delete a slot. NOTE: To add an SSID into a slot, the SSID profile must first exist. To learn more, click here. Click on Wireless SSID slots then click on Add wireless SSID and select an SSID then click Add. NOTE: If you have not created any wireless SSIDs, click on Go to the SSIDs section. To learn more, click here. To delete an SSID slot from the access point, click on the ellipsis icon of the SSID and click on Delete slot > Delete. NOTE: This will only delete the SSID from the access point, dissociating it from the access point. The SSID profile will remain in the WiFi SSiD section. To permanently delete or disable an SSID profile, go to the SSIDs section. To learn more, click here. Configure IP - select Use DHCP or Manually. Server IP - enter an unused IP address from the address range used on your LAN. Gateway - enter the gateway for IP Server. Subnet mask - enter the subnet mask for the IP address. Primary DNS - enter the DNS Address. Secondary DNS - this setting is optional. VLAN tagging - allows you to disable or enable the VLAN tagging. Enter or select your TCP/IP settings then click Save. The Radio section allows you to configure the 2.4 GHz or 5 GHz wireless radio settings of the access point. Follow the steps below to configure the radio settings. 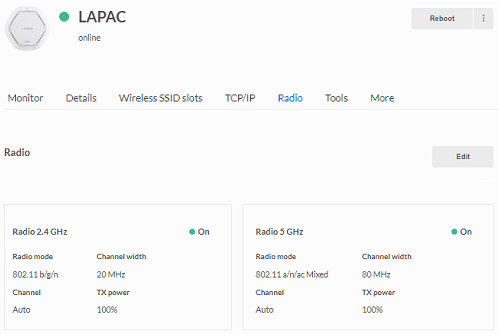 The 2.4 GHz and 5 GHz radios are enabled by default. Toggle the slide switch to disable a radio. 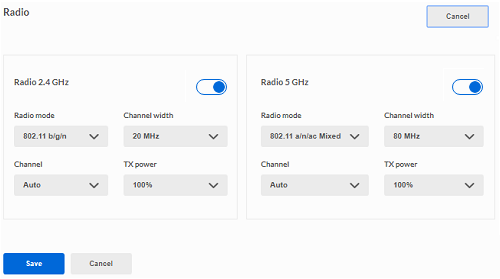 You can also configure the Radio mode, Channel width, Channel, and TX power of each radio. The table below show you the radio settings for the access point. Use the Tools section to troubleshoot the access point. Ping tool - determines the accessibility of a host on the network. Click the Ping button to ping an IP address or hostname. Blink LED - click Run to make the light blink on your access point to identify it. The light will blink for 30 seconds. Rogue access point detection - detects an unexpected or unauthorized access point in your network. Select between 2.4 GHz or 5 GHz radio and click Run. Time zone – allows you to view and edit the access point’s time zone. Local access - is the username and password for local access to the device. Remote Syslog status - allows you to configure the remote syslog settings. LED light - allows you disable or enable the access point’s status light. NOTE: To set the same settings on ALL your access points in a Network, go to the Settings section located on the blue bar at the top. The settings in the Access Points > More tab is applied per access point only. Follow these steps to change the time zone. Click the drop-down arrow to select a time zone. You may also enter your preferred NTP servers. Click Save. Follow these steps to learn how to create a username and password. The default admin username is admin. Enter a password and an optional password hint in the Password and Add password hint fields respectively. Click Save. Follow these steps to learn how to set up the remote syslog settings. The remote syslog feature is inactive by default. Click the drop-down arrow then select Active. Enter the remote server’s IP address then click Save. Follow these steps to learn how to disable or enable the access point’s status light. Click the drop-down arrow and select Enable or Disable. Click Save.